He has several international publications, articles and scientific case presentations to his credit. 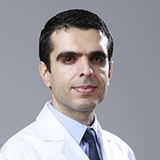 Dr. Mehmet is specialist interventional and non-invasive cardiologist since 2011. He performed thousands of diagnostic coronary angiograms and angioplasty procedures, transient and permanent pacemaker implantation procedures and various non-invasive cardiac testings such as ECG, Echocardiography (TTE,TEE), exercise, dobutamine and nuclear stress. Also he performs interpretation of ambulatory blood pressure and ambulatory ECG monitoring. He can speak in English and Turkish.